New to Gansbaai we are now offering White Shark Breaching and predation trips combined with Great White Shark Cage Diving. This new trip is an exclusive for the area as previously only this was available in False Bay at Seal Island. This is an excellent all round trip which includes looking for Great White Sharks hunting Cape Fur Seals and the world famous hunting technique called breaching. Breaching is when Great White Sharks spot their prey on the surface of the ocean and propel to the surface and out of the water to ambush the seals. This is a spectacular sight and common in the waters around False Bay at Seal Island and also Dyer Island near Shark Alley in Gansbaai. There are many of our clients now coming back to Gansbaai after being here once and are looking for something different. Shark Bookings has listened to their needs and created a special trip here in Gansbaai to give everyone the chance of seeing a Great White Shark attack a seal. To nature lovers, watching a Great White Shark kill a seal may not be in your wish list but if you are lucky enough to see a predation on a seal you can find comfort that many do get away. The seals are very agile in the water and excellent at avoiding shark attacks. If a seal is aware that the Great White Shark is lurking below and predating on them they will be ready for the ambush. Watching a predation attempt is fantastic and exhilarating as for most of the attempts the seal manages to get away. The seals are much faster than the sharks. They are very intelligent and what happens in a predation attempt is that the seal will try to stay by the tail of the shark (as far away from the mouth as possible). The seals are much more agile and faster in the ocean than the sharks so when the shark is by the surface you will see the seal dancing around behind the shark. This would naturally look suicidal but after watching for a few minutes you will realise how clever it is. The hunting scenario normally takes a good few minutes and normally starts with a surprise on a seal and if the shark misses then the seal will be on it’s tail. After the shark realises that the seal has the upper hand it will dive down deep out of sight. This is when it get’s really exciting! The seal will bob around with tail in the air and head underwater intensely looking for the shark. The Great White Shark is designed perfectly for this being dark on it’s back which makes it very difficult to pick up if it is below. The shark will lurk at a depth, watching the surface for the seal and with a few kicks of the tail within a couple of seconds will be propelled to and out of the surface possibly with the seal in it’s mouth. Great White Sharks are warm blooded and have tremendous power but not much stamina and it takes much of effort to hunt a seal and normally only makes a couple of attempts before tiring. The only fault with the Great White Shark’s design is that it’s underside is white which also includes it’s lower jaw. When the shark shoots to the surface normally you can see a flash of white. This may be enough for the seal to see the shark and make a quick escape from those infamous Jaws. There is a very high level of activity of Great White Sharks in Gansbaai around Dyer Island and Geyser Rock and close to Shark Alley. We have a colony of 60,000 seals on Geyser Rock which many come back to the island from the open ocean at first light. What is different from Seal Island is that there are many other locations around Geyser Rock and Dyer Island where the sharks hunt Seals and not one hotspot like that by Seal Island. From last year’s exploratory trips the crew have found some good areas around the island where predation and breaching activity is good. Seal Island in False bay is the prime place to see the Great White Sharks breaching and predating on seals but these trips are in heavy demand and often fully booked during the peak season from May – September. Due to popular demand we have created a special combination trip which will combine White Shark Breaching (Air Jaws) followed by the Great White Shark Cage Diving. This is a much longer trip than the standard cage diving trip and it should be packed with excitement and awesome shark action. 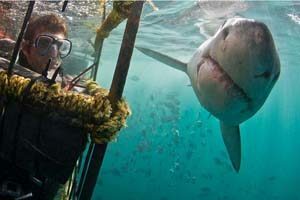 For the shark lovers this would be the ultimate day trip to see the Great White Sharks in Gansbaai.